EASTBULL USB 2.0 Flash Drives Memory Stick has a Variety of Capacities Selection, Convenient Date Storage and as a Gift Send Your Anybody! Why you choose EASTBULL USB Memory Stick? ✔Superior metallic finish makes it look stylish, elegant and chic. ✔360°swivel metal side allows you to carry without annoying cap-loss problems. ✔Built-in with the LED indicator, indicating the data transfer status during use. ✔Cap less design with integrated loop makes it easy to attach to keychains, backpacks and etc. ✔Can be used in schools, colleges, universities and other professional institutes to provide study material to their students. Interface Type:USB 2.0, backwards compatible to USB 1.1. Compatibility:Desk PC, Laptop, Mac, Tablet, Speaker with USB port. Operating System:Windows 7/Vista/XP/2000/ME/NT, Linux and Mac OS. Hand Wrist Strap Lanyard Size:7.09"
EASTBULL USB Memory Stick is Your Preferred Choice! If you ever need anything about our products, please feel free to contact us. We always stand at your besides. Friendly Design: Size: 2.2"×0.79"×0.39"(Fold). Outstanding 5 mixed color, 360° silver metal swivel protect USB connector and capless style that no worries to lose cap, Keyring hoop for lanyards to keep from getting lost. USB 2.0 Memory Sticks: 2.0 Fast Data transmission speed, suitable for storing digital data for school, business or daily usage. The digital data includes music, video, photos, movies, manuals, software,etc. Compatibility: Supports almost all operating system including Windows 2000/7/8/8.1/10/Vista/XP/2000/ME, Linux and MacOs 10.3 and above. Plug and Use: No need to install any software, just simple plug into the USB port of computer or other devices and use it! Good gifts for family, friends and colleagues. 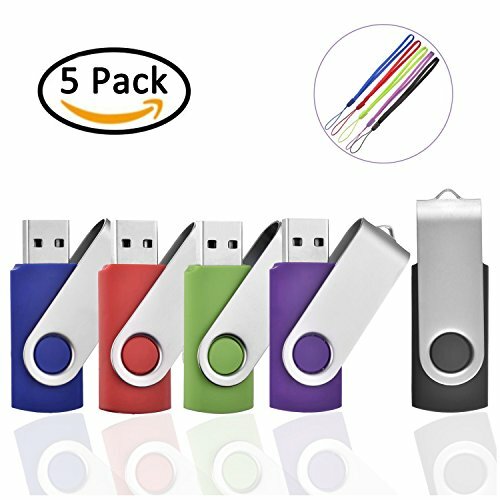 What You Get: 5 Pack of 32GB USB 2.0 Flash drives, 5 lanyards, 100% RISK-FREE SATISFACTION GUARANTEE,60-days money back or replacement and friendly customer service. If you have any questions about this product by EASTBULL, contact us by completing and submitting the form below. If you are looking for a specif part number, please include it with your message.